Gingerich, 1998). The specimen is fairly complete (Figure 3C) and the dental associations are well documented (Bloch and Boyer, 2001, 2002b). Carpolestes is unique among plesiadapiforms in having a foot that is better adapted for powerfully and precisely grasping small diameter supports, a UAJ that reflects even more freedom of motion, a humerus that suggests relatively stronger grasping, and a vertebral column that indicates only infrequent use of a bounding gait on either vertical or horizontal substrates. In terms of behavior, these features suggest that Carpolestes spent relatively little time on large diameter supports, and instead most frequently occupied a small branch niche where grasping is more useful than claw-clinging and bridging is more effective than bounding. In contrast to the condition in other plesiadapiforms, the feet of Carpolestes are similar to the hands in having prehensile proportions, a result of unusually short metatarsals and long toes (Bloch and Boyer, 2002b; Figure 5A). In both the fingers and toes, the proximal phalanges are more curved than those of other plesiadapiforms. The intermediate phalanges are not mediolaterally compressed, but have a more spherical cross section than those of other plesiadapiforms (Bloch and Boyer 2002a). The unguals are relatively smaller and slightly broader than in other plesiadapiforms. The articular surface for the intermediate phalanx has a slight dorsal orientation such that when articulated, it is canted dorsally rather than palmarly on the hands and feet. Furthermore, on the ventral surface of the shaft, distal to the flexor tubercle, there is an expanded area that may reflect the presence of an expanded dermal pad in life, as a similar structure seems to do in the unguals of Petaurus as well as in the grooming claws of the euprimate, Tarsius. These features, taken together, suggest less frequent use of the hands and feet for claw-clinging and more habitual grasping of small diameter substrates (Figure 5B). Figure 5. 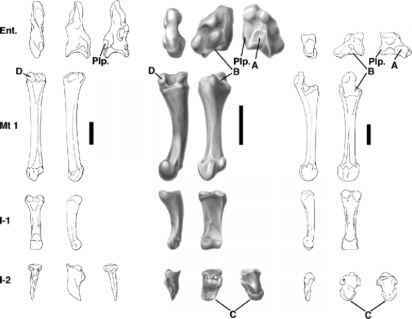 (A) Reconstructed left foot and ankle of Carpolestessimpsoni (figure from Bloch and Boyer, 2002a; fig. 4a). Note that the hallux is divergent from and in opposition to the other digits, the metatarsals are short, and the nonhallucal digits are relatively long. All of these features indicate euprimate-like grasping. The foot is unlike that of euprimates, however, in having short tarsals and a diminutive peroneal process on the proximal hallucal metatarsal. Long tarsals and a prominent peroneal process in euprimates are thought to facilitate powerful leaping with stable landings (Szalay and Dagosto, 1988). Abbreviations: Ast., astragalus; Cal., calcaneum; Cub, cuboid; Ent., entocuneiform; Mt., metatarsal; Nav, navicular; 1-1, proximal phalanx, first digit; 1-2, distal phalanx, first digit; V-1, proximal phalanx, fifth digit; V-2, middle phalanx, fifth digit; V-3, distal phalanx, fifth digit. (B) Reconstruction of Carpolestes simpsoni (figure from Bloch and Boyer, 2002a; fig. 2b). Locomotion on small diameter supports, depicted here, is inferred from the specialized grasping hands and feet; strong, mobile elbow; robust fibula; mobile ankle joints; mobile vertebral column; gracile pelvis; and specialized dentition (Bloch and Boyer, 2002a). Gray areas in B represent bones present in UM 101963. Scale in A = 5 mm. Scale in B = 5 cm. Figure 6. 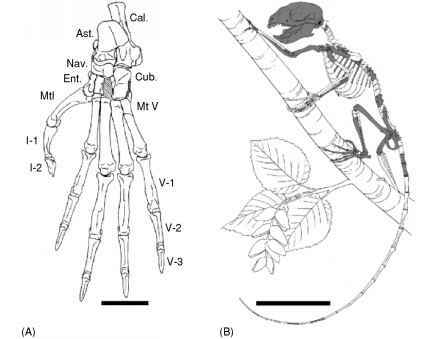 Left hallux of Paleocene plesiadapiform Carpolestes simpsoni compared to those of extant euprimate Tarsius syrichta and extant tree shrew Tupaia glis (figure from Bloch and Boyer, 2002a; fig. 3). The entocuneiform (from left to right) is in ventral, lateral, and medial views, the metatarsal and proximal phalanx are in ventral and lateral views, and the distal phalanx is in ventral, lateral, and medial views. Euprimate traits present in the hallux of C. simpsoni include a medial expansion of the distal facet on the entocuneiform (A) for articulation with the first metatarsal that forms a saddle-shaped, or sellar joint (B), and a distal phalanx that supported a nail instead of a claw (C). Primitive traits, also seen in the tree shrew, include a first metatarsal with a peroneal process that is not enlarged (D). Note that the distal, relative to the proximal, end of the hallucal metatarsal of C. simpsoni is laterally rotated about 90° compared to the condition in that of tupaiids. Similarities to euprimates are reflective of C. simpsoni having a divergent and opposable hallux, while the similarities to tree shrews (and not to euprimates) are reflective of C. simpsoni not being a specialized leaper. Size of hallux normalized to the length of the metatarsal. Abbreviations: Ent., entocuneiform; Plp, plantar process of entocuneiform; Mt 1, metatarsal, first digit; I-1, proximal phalanx, first digit; I-2, distal phalanx. Scale = 2 mm. Szalay and Dagosto 1988). Furthermore, the distal articular surface is saddle-shaped, narrow and cylindrical on its ventral margin, and expanded proxi-mally on its medial side. The articulating metatarsal can rotate medially from its most adducted position by ~60°, at which point a blunt medial process on the metatarsal meets a correspondingly spherical depression on the medial side of the entocuneiform. Once these surfaces are in contact, there is an increase in the axial mobility of the metatarsal that allows the abducted hallux to form a more stable grip on the substrate than it might be able to achieve otherwise. The metatarsal itself is no more robust than in other plesiadapiforms, but it shows a greater degree of torsion, which makes the hallux more completely oppose the rest of the digits. The proximal hallucal phalanx is flattened with a mediolaterally broad, but proximodistally short distal articular surface that is almost completely plantar-facing. This wide, shallowly dished surface accommodates the distal phalanx that is dorsoplantarly shallow and mediolaterally expanded, distinctly unlike the nonhallucal unguals of this animal and more consistent with morphology that reflects the presence of a large dermal pad and nail in most extant euprimates, as well as some marsupials and rodents. The ankle of Carpolestes differs from other plesiadapiforms in that: (1) the fibula is relatively larger; (2) the groove for the tendon of the tibialis posterior muscle and the groove for the tendon of the peroneous brevis muscle, on the tibia and fibula respectively, are deeper; and (3) the opposing articular facets on both the tibia and fibula are convex indicating increased axial mobility and possibly a synovial articulation. As might be expected, the astragalus reflects this added mobility in lacking the distinct, often acute, ridge marking the boundary between the tibial and fibular facets on the astragalar body, which restricts the UAJ to plantar and dorsiflexion in other plesiadapiforms. The greater emphasis on grasping behavior in Carpolestes is reflected in the forelimb primarily by a relatively large and medially extended entepicondyle. Such medial extension provides relatively more room for the attachment of the flexor muscles of the wrist and digits. Furthermore, the distal articular surface of the humerus suggests even more complete segregation in the function of the radius and ulna. The zona conoidea is so deep that it creates both a lateral keel on the trochlea for articulation with the ulna (on the medial margin of the zona conoidea) and a lateral ridge medial to the capitulum. This condition is otherwise unique to euprimates and microsyopid plesiadapiforms (Beard, 1991b; Silcox, 2001). Finally, the vertebral column of Carpolestes has an anticlinal vertebra positioned within the thoracic region and narrow spinous processes on the lumbar and posterior thoracic vertebrae, indicating that it was capable of sagittal flexion. However, the vertebral column is not particularly suited for the powerful sagittal flexion and extension required in a bounding gait, such as that inferred for paromomyids (Boyer and Bloch, 2002a,b). Such a de-emphasis on features reflective of a bounding gait is expected for an animal that spends the majority of its time in a small branch niche where bridging is safer and more effective than bounding (Sargis, 2001b). Based on this specimen, carpolestids appear to diverge from the general plesi-adapiform body type more than any other group we have studied. Interestingly, many of the deviant aspects in carpolestid morphology and inferred behavior are similar to those observed and/or inferred for early euprimates.